Stone crushing line is special equipment producing construction materials, which can save 50 percent of energy compared with traditional sand making machine. It can process rock, sand and river stone into construction materials with different sizes. Because of uniform size and high compression strength, these materials can satisfy construction requirements and improve building quality. Stone crushing line takes advantages of reliable performances, reasonable design, convenient operation and high efficiency. 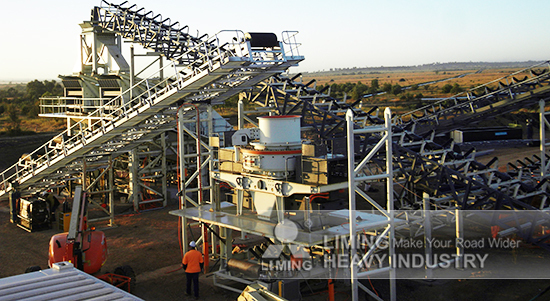 Stone crushing line starts with vibrating feeder. Vibrating feeder sends materials to jaw crusher and then sends to sand making machine, impact crusher or hydraulic cone crusher. After that, aggregated rock will be screened out by vibrating screen and sent to sand washing machine for cleaning. Finally the aggregate satisfying requirements are got.